Bad, very bad OS. Performance is crap. Tons of spyware and plus handy features are removed. To avoid spyware I would pay for an upgrade. Win 8.1 was not perfect, but it was fast, no spyware and comfortable to use. I will have to restore Win8.1 backup. I wish I could move to Linux. Unfortunately my hardware is not compatible with Linux... Neither software I use do not has Linux versions. I was so hoping this would be the worthy successor to Win 7, but I think no (in it's current form). I updated to this recently, expecting everything to work on my fairly new PC, but boy, was I wrong! Display drivers, sound card, and network adapter all did not work! Troubleshooter could not help me with driver issues, even though it apparently used my previous drivers that worked with Windows 7!! Really? Am quite disappointed that they would release something like this after touting it so much. May try it again later after the bugs are patched up. Luckily, there is a rollback feature that you can use before thirty days are up. I did not last two days. Disappointed, Yep. Bloated adware POS. Edge is useless, don't care about Xbox garbage, Cortana or what ever they call it, WTF? Did the morons at M$ even listen to any of the complaints they got regarding Win8. I like 8.1 better than this dog. If I were to continue using 10 I would have rather paid for it and had no spyware. Nothing is really free is it. Reviewing this from a win 7 user. Its just not that good. Its very similar to windows 8, Which I have tried on a friends pc and I didn't like it either. Major issue is the start menu. I was able to pin programs and files with ease on my win 7 pc. Its impossible with this. That tile menu that comes with it is useless unless your all into all of ms software. I give them a pass of all my driver software that didn't work including the nvidea isssue which everybody as heard about. But I found it difficult to find the settings for various things that are very simple in windows 7. Overall I guess if you have win 8, you probably should upgrade since it looks and feels the same, but if your a windows 7 user, don't do it. Trust me. thanks! now im ready to take the next step to try out windows 10, the dl worked great and im about to write to dvd.. The basics of Windows is rock steady but there's still too many quirks with apps. 10122 is very buggy.Got a black screen on desktop computer after login. Laoded ok on laptop but had lots of explorer crashes and start menu will not open 1./2 the time. Also CPU usage much higher with this version. After the mess what was Windows 8. Windows 10 is a big improvement. Bringing together elements of both Windows 7 and Windows 8, but with more options to work the way you want to, full screen or desktop. For me personally - I do not like the icons they look cartoon like. I would prefer the look and feel of Windows 7. I really hope there will be a way to replace the icons - working with the existing third party add-ons would be great (eg Icon Packager). I see that transparency is back - sort of. I hope Windows 7 style transparency will be an option in the final version. My PC and graphics card can easily do transparency with little or no impact on performance. Basically Microsoft need to stop taking stuff out, and put stuff back in. Windows 7 is good looking and fast. 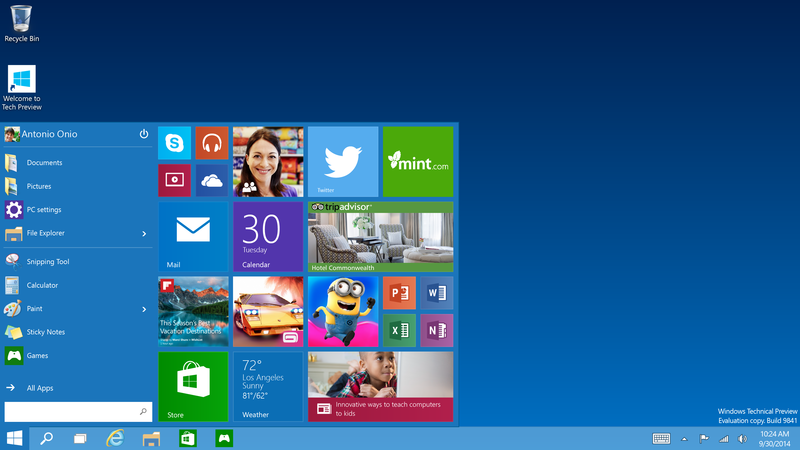 Windows 10 needs to look as good if not better - currently it does not. Customisation is key. Give the user what they want, and since no two users are the same, give them choice. Currently I give it a 2 - disappointing, could be much better.